Failing to protect our children (or employees) from bullying has very real and very deadly consequences. 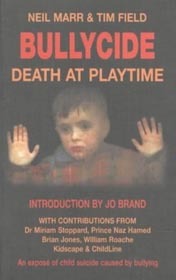 The term 'Bullycide' was coined by journalist Neil Marr in the book Bullycide: Death at Playtime which was co-written by the late anti-bullying crusader Tim Field. It draws on the real stories of torment experienced by children at the hands of bullies. Driven beyond their ability to cope with the systematic abuse of bullying, and seeing no other way to escape, these precious children took their own lives to end their suffering. While it is now well known that bullying leads directly to suicide, or bullycide, (with adults as well as children) bullying is still not considered to be an issue deserving of serious consideration. Bullying is dismissed as a right-of-passage experienced by all children while the victims of bullies are blamed for having done something to be deserving of the bully's hostile attentions. They are told to "toughen up", "quit being a whiner" or "get a thicker skin". When a target of bullying tries to speak out about the abuse they are betrayed and told that "nobody likes a tattle-tale". Bullying is far from harmless and needs to be recognized for the very serious threat that it is. In addition to physical assaults bullying has a devastating impact on the emotional and psychological well being of victims. Bullying is a relentless assault on the soul. Suicide caused by bullying is something that principals, teachers, parents, managers, human resources professionals, EAP providers and union leaders need to begin taking seriously - very seriously. Moms speak out about the bullying/suicide connection. Kids who took their own lives because they thought it was their only way out of a hopeless situation. It is about the tragic choices they made in an effort to end the pain - when they believed there was no other solution. It is told by mothers who are willing to share their own personal pain as they watched their children suffer and struggle. It is about their own efforts to advocate for their children while they continue to deal with their own devastating loss and the aftermath of bullycide. You can find more information or order your copy here. The bullying / suicide connection has been demonstrated time and again. The consequences of bullying can be lethal. Bullying is directly implicated in child and teenage suicide. Addressing the issue of bullying at school or even after school hours through stalking or cyberbullying (web bullying) is an essential component of teen suicide prevention. Targets of bullying, whether they are children or adults, are subjected to treatment which is designed to eat away at their self esteem and drive them to despair and to suicide. In research conducted by Prof. Heinz Leymann in Sweden into mobbing (an extreme form of workplace bullying) he determined that approximately 12 percent of those who had committed suicide had recently been bullied at work. Bullycide is able to fly under the radar as the bullying / suicide connection is rarely made. Suicides are written off as the result of obviously troubled individuals without a serious investigation into why they were so troubled. In this way bullies are let off the hook. In fact it gives bullies more ammunition and allows them to justify their behavior saying, "see they were mentally unstable, there was something wrong with them", thus blaming the victim while abdicating responsibility for their own reprehensible actions. From BullyOnline.org... "Bullycide: Death at Playtime is a book by Neil Marr and Tim Field which exposes the death toll of child suicide caused by bullying at school. Every year, at least 16 families will experience the nightmare of coming home to find the lifeless body of their child (UK Statistics). They will then discover that the bullying which drove their child to suicide had been going on for months and that the school knew all about it but had taken no effective action. The moment parents start their investigation they are likely to find themselves and their dead child vilified and blamed. "Excellent research. Well written work. So difficult to read the torment these children suffered. Bullycide is presented by writers Marr and Field in a straight forward, non theatrical manner. The facts of the cases speak for themselves. Books such as Bullycide are a must read. This book will help to enlighten readers to the terrible torment children who are bullied endure. This pioneering book reveals the main reason why children are picked on: because they have a very low propensity to violence and a mature understanding of the need to resolve conflict with dialogue rather than violence. Bullies exploits these values - which society claims to cherish - and torment their prey for weeks, months, or years until the anger built up inside the target becomes uncontainable and explodes into violence. Because of their moral integrity and heightened emotional maturity, almost all targets of bullying will direct the anger onto themselves - which results in depression, self-harm or suicide. This heroic act is in stark contrast to the cowardly and thuggish nature of the bully who, when called to account, will aggressively but plausibly deny everything. The bully is often able to manipulate the perceptions of the responsible adults so that they also now victimise the target." 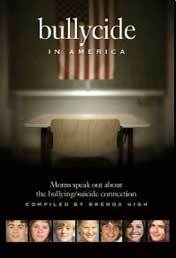 If we need further evidence of how deadly bullying can be we need look no further than the heartrending stories found in the book, compiled by Brenda High, Bullycide in America: Moms speak out about the bullying/suicide connection. From the point of view of mothers who have survived their children who have been driven to suicide by relentless physical abuse and/or psychological torture Bullycide in America paints a stark picture of the torments faced by many students in todays schools. In spite of their pain these mothers have come forward to tell their story and the stories of their children so that we may learn from the harsh lessons they have endured. Read this book with a view to comprehending the viciousness our kids face at the hands of bullies, to understanding how devastating the consequences in the lives of those affected and perhaps most importantly, what you can do to see the signs in your own child that they are the victim of bullying - before it is too late. Key to preventing bullycide is creating an environment that encourages targets of bullying to come forward and speak out about their abuse. Victims of bullying and bystanders need to feel confident that they will be heard and that their concerns about bullying will be taken seriously by those in authority and will be addressed with the urgency it deserves. Often targets of bullying who come forward are dismissed, even punished for doing so. They are also afraid of being seen talking to a teacher (or manager in the case of adult bullying) as this will likely lead to reprisals from the bully. However, without accurate reports of bullying activity and ongoing documentation of continued bullying incidents even the best intentions of administrators is thwarted.